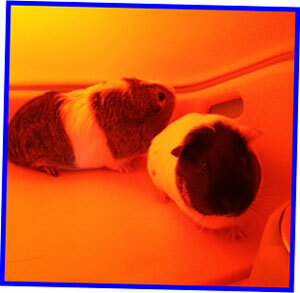 The Guinea Pig Eglu has been given a brilliant review on parenting blog site ‘Susan K Mann’. Susan bought her children two guinea pigs earlier in the year and they had been living indoors in a ‘boring but large’ cage up until this month, but then she was introduced to the Eglu. Although she compares it to Mork’s space ship from Mork and Mindy (that’s a new one), she does call it ‘the funkiest and coolest looking guinea pig habitat in the planet’. Well, we don’t like to brag! The Eglu withstood Susan’s kids test-driving toy cars up and down it, and it has proved to be the perfect choice of guinea pig house for the whole family. She loves the bright colour, ease of cleaning and convenient access to the food and water. Plus, living in Scotland, the twin walled insulation and draught free ventilation is a dream! You can read the full review by visiting her blog, or visit our website to read more about the Guinea Pig Eglu. 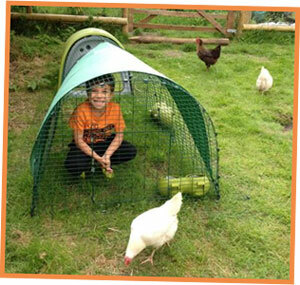 It may be cold outside but it’s always sunny in an orange Eglu! Keeping chickens is not only fun, but greatly beneficial for many people, as Heronsbridge School in Bridgend has proved. They have been keeping hens for a few years now, and have found it to be brilliant for their pupils with learning needs. Keep an eye out in the Guardian this Saturday for a feature on Heronsbridge School. Welcome to the New Gallery! Great news for those of you that can’t get en-ouef of ‘papping’ your hens – the Omlet Gallery is back in action! With a brand new design it is better than ever, quicker to use, and easier to browse. If you’ve uploaded images in the past, don’t despair, your photos are still there and looking splendid. If you haven’t used the gallery before, now’s your chance to show off your prettiest pets (and your photography skills). And if you prefer to ooo and ahhh at other people’s pictures, then go ahead…there are hundreds to look at. Visit the new gallery page now and have a giggle! This chap’s impression of a Gingernut Ranger didn’t have the chickens fooled! Compostwoman’s latest post has been blogged, and the worm-derful news is…she has compost! And not just any compost, may we point out, but the best compost money can’t buy. Worm compost is very concentrated, so a little goes a long way, and it is full of fabulous nutrients that your plants will love. 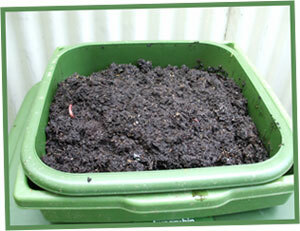 After just four weeks of using the Hungry Bin, Compostwoman happily harvested her first batch of compost. She was impressed at the ease of releasing the tray of compost from the bottom, with nothing falling out of the bin in the process. Only one worm had made an escape, and he or she was quickly reunited with his friends back in the bin. Compostwoman added the compost to some pots of veggies, as well as giving them a dose of tasty worm tea. Click here to read the full post, and visit our website for more information on the Hungry Bin. Order yours by Sunday and you’ll get 25% off plus free delivery with code: GOLDDELIVERY. Four weeks in and Compost Woman harvests the Hungry Bin’s first batch of compost! What will the world be like in the year 2050? Well, flying cars may be a bit eggstreme, but we think it’s fairly likely there’ll be an awful lot of Eglus out there. In The Eco Future exhibition in Abu Dhabi visitors can decide for themselves what the future might hold. Opening later this month, this is set to be a fantastic eggsibition that will entertain, educate and inspire children. Kids are invited to take part in games and interactions, making choices about their future as they enter various zones. Each zone addresses a different subject matter (drinking, eating, enjoying, moving and building), exploring the impact of our current lifestyles on the planet. But what does this all have to do with Omlet? There is an Eglu on display in the exhibition! Keeping chickens in an Eglu is just one of the examples of how new ideas, technology and behaviour can have a positive effect on our planet. Can’t make it to Abu Dhabi for the exhibition? Our advice – keep calm and keep chickens!